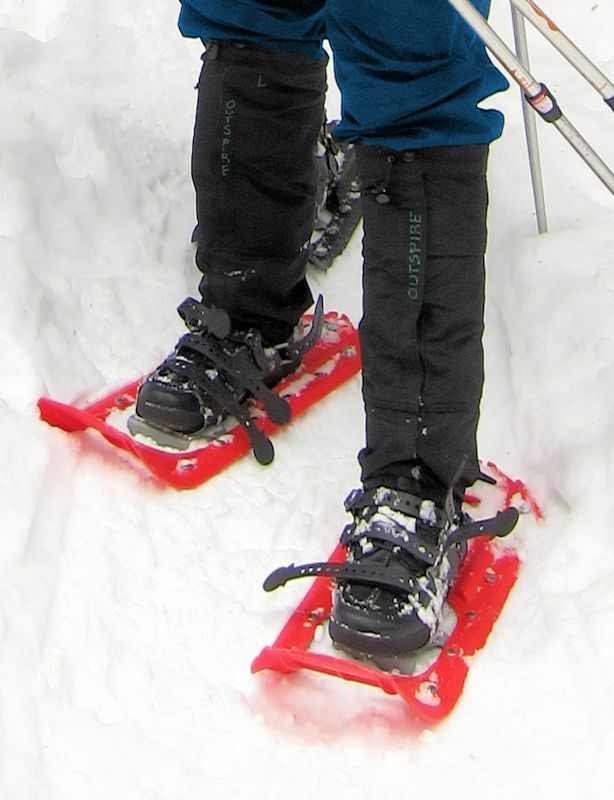 Snowshoes and gaiters. Please click for larger image. Do I need snowshoe experience? Absolutely not. If you know how to walk, then you can snowshoe. The only difference is that snowshoes are a little larger than what you are used to wearing, so it will require a slightly different stance. Most people adapt within a few minutes. The larger footprint allows you to “float” in the first few inches of snow without sinking all the way down like you would otherwise. Ideally, wear comfortable, stiff-soled waterproof boots. Examples are regular hiking boots or sturdy winter boots. Lower-cut shoes work, but your socks may get wet. Our gaiters can help; they are cuffs which go over your lower leg and cover the top of the shoe to help keep snow out. Clothing that allows you to stay comfortable is key. Snowshoeing is more aerobic than walking and even if you start off chilly, you may work up some heat before long. You’ll want to have several thin layers that can be adjusted rather than a single thick layer. Cotton, which traps moisture, will make you feel cold when it becomes damp. Better are synthetic, silk or wool fabrics, especially for underlayers, which help keep you more comfortable. A long-sleeved lightweight top under a poly fleece sweater under a wind/water-resistant shell is a good combination. Shell pants or other water-resistant pants and warm socks are recommended. Don't forget warm gloves or mittens and a hat. We provide you with snowshoes, poles, snow gaiters, sunscreen, daypack, bottled water, trail snacks and a knowledgeable guide. Box lunches are available by prior arrangement for an additional fee. Warm hat, warm waterproof gloves or mittens, sunglasses, gaiters (if you have them) and your camera. Where will I meet my Outspire guide? Most snowshoeing trailheads are near the Santa Fe ski basin, within 30 minutes of downtown Santa Fe. Your guide will call to provide specific meeting information, usually near downtown. If you do not have your own transportation, Outspire can work with you to arrange something. How long is a typical outing? Trips are customized, but most guests find a 2-3 hours on trail outing ideal. Every year is a little different, but we usually begin snowshoeing in December and finish the season sometime in March. Call or email for expected conditions.